Mohammad AlRefaei also known by Refaei is an active Skydiver, who made 300+ jumps yearly since he started. In addition to being a professional skydiver, Refaei is a certified Wingsuit Pilot and an experienced Base Jumper. He has represented his country ‘Kuwait’ in almost every jump, Refaei has shown his love for his country by holding up the Kuwaiti flag while jumping or by wearing the traditional clothes. He attracted the attention and became a celebrity in no time. His videos got over 500k hits in the past year as well as having T.V interviews; cover pages, and newspapers talking about his ability to jump. Today, Mohammed Al Refaei is known as the “Fearless Kuwaiti of the Year”. Mohd is considered one of many world extreme athletes fan who inspired him to seek about the journey of skydiving. His passion started to grow which he decided then to become a professional skydiver and also an Instructor. 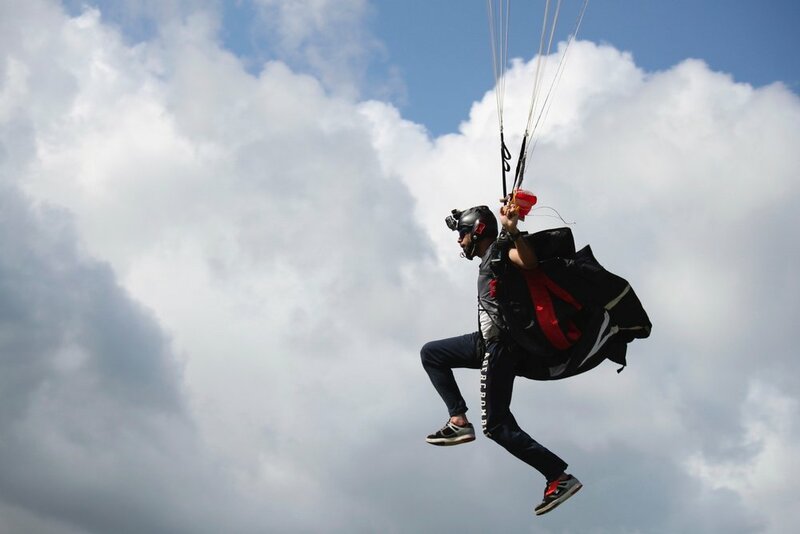 Refaei focused on his life in the air and started to train on Wingsuit flying. He has always been fascinated by anything that could fly and trained hard to reach his dreams to fly his wings. Today, Refaei is considered one of the best skydivers in the region, that gave him the credibility to pursue his dream and learn about ‘base jumping’. A Base jump is a parachute jump from a fixed object rather than an aircraft, and to be able to do that you should be a professional skydiver. My name is Roberta Mancino and I am professional skydiver with 7500 jumps, my job is to teach people how to fly in the sky and in the wind tunnel mostly freely and freestyle. I coach Mohammad Al Refaei few years back in Switzerland and he is really a talent flyer, he learns really quickly and he was already good for the small experience he had at the time. I think I can help him to became a really good skydiver and take him to the level of Freefly skydiving and wind tunnel competitions and Freefly formations world record. In only few he can be top level in the sport.